Our amazing cycling tours explore the green areas surrounding the sprawling metropolis of Bangkok where we discover floating markets, pottery villages, local industries, rice fields, vineyards, mountains, klongs and Thai villages. Incredibly, we show you a place in the heart of the city that development has forgotten where a secret world of canals, jungle and Buddhist temples is waiting to be discovered by intrepid cyclists. Our bike tours depart every day with a minimum of two people. Our guides know the areas like their own backyards, which in some cases they are. We supply all the equipment and will pick you up and drop you off at your hotel in Bangkok. Bangkok Bike Rides are suitable for families, couples, singles, young, old and anyone that can ride a bicycle. 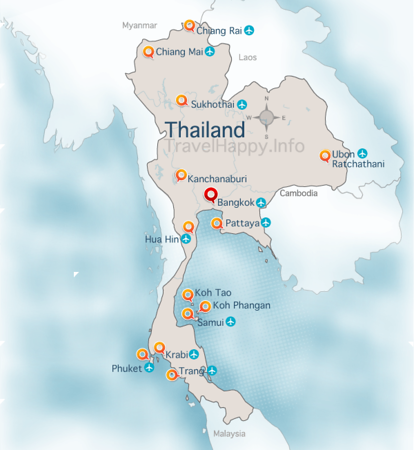 We have daytrips in and around the city as well as overnight tours to Khao Yai National park and Kanchanaburi. We also cater for those looking for some real, technical mountain biking and can create al kinds of tailor made or custom itineraries for groups and individuals.